Many people who visit my practice have an overgrowth of the yeast Candida Albicans It’s both bad news and good: it can be tricky to get rid of, but at least they know why they feel so bad. Everyone has some yeast (Candida Albicans), it's a normal part of your intestinal bacteria but an overgrowth, which indicates that the good bacteria have been overwhelmed, undermines your health, suppresses your immune system, makes you tired and depressed, causes IBS, poor digestion, food sensitivity or intolerance, skin problems, anxiety, bloating, makes you fat or thin, causes recurrent infections .......I could go on but I think you get the picture. Antibiotics destroy bacteria that would normally have a protective, antifungal effect, and the imbalance enables yeast to thrive. Diet – especially those high in fermentable carbon sources such as mono- or dimeric sugars (sucrose, glucose, and lactose - so that's dairy (especially skimmed and semi skimmed milk), refined carbohydrates, confectionary etc) – plays a key role in encouraging yeast overgrowth. Many of the things we consume and/or are exposed to coupled with health-related conditions, can create an environment in which healthy bacteria cannot thrive. Many factors associated with Candida overgrowth are disruptive to the body's endocrine system, causing hormonal abnormalities that, in turn, can be aggravated by antibiotics, and even by Candida Albicans itself. Candida can be tricky to eradicate and may take several months (for some, much longer). Following an anti candida diet and taking supplements to kill the yeast, improve digestion and restore healthy bowel bacteria, is the quickest way to turn your health around. If you often feel under the weather (there are a list of symptoms further down) do the spit test. Have a glass of water by your bed. In the morning, before drinking or eating, spit on top of the water and observe. If the spit disperses you’re in the clear. If anything grows under the spit, speckles appear in the water, a cloudy pool sinks to the bottom or all the water turns cloudy, you probably have an overgrowth of Candida. With the diet and supplements it is likely that you will start to feel much better very soon. Clients have reported noticeable improvement in as little as three days and significant changes in two to three weeks: you could feel better than you have for years. If you have several of these symptoms and your spit test grows a slimey critter then I suggest you try both the diet and the supplements. There is nothing to lose and everything to gain. The worst that can happen is that you lose weight, feel great and end up with really healthy bowel bactiera which is all good. Candida decomposes cell membranes, so its presence in large numbers is a sign that your immune system is fighting a losing battle to keep yeast under control. A weakened immune system will wreak havoc on your overall health leaving you prone to infections, inflammation, colds and flu. During a long-term infestation, yeast can change into its fungal form, developing roots that implant themselves in the intestinal wall or other mucosal linings. These roots enable the toxic by-products of fermentation and other harmful material generated by the fungus to be absorbed, which can result in an immunological reaction. This, in turn, can develop into a yeast syndrome affecting all of the body's systems. Take some time to think about when you first started to experience symptoms. When did you start to feel exhausted? Was it around the time or shortly after other events such as periods of stress, hormonal changes (such as pregnancy), antibiotic use, surgery etc. Doing this exercise will help you to determine how long you may have had your Candida overgrowth and will give you some idea of how difficult it will be to get rid of (although this is only a very basic guideline and it varies from person to person). If for example you have been feeling unwell for a long time then it is likely to take longer to completely eradicate the yeast. Some practitioners believe that Candida overgrowth can lead to the onset of chronic illnesses such as chronic fatigue symptom (CFS), fibromyalgia, Epstein-Barr virus, lupus, multiple sclerosis (MS), Alzheimer's, Crohn's disease, arthritis, cancer, and autism. Purging this harmful and destructive yeast from your body requires patience, perseverance, and a multi-pronged approach. The first step is to start work on reducing the amount of yeast in your system. There are two ways to reduce yeast overgrowth: starve it by cutting off it's food supply (sugar) and use natural supplements to kill it . Diet and healthier lifestyle choices are sometimes enough to resolve mild cases of Candida. However, a product with antifungal activity is usually required in moderate to severe yeast infestations. Most require a course of three months or more. Other natural yeast treatments include increasing vitamin C and other antioxidant intake (I stock a fantastic product Antioxidant Supreme which is made from 22 fruits and vegetables, is a highly bio available food state formula (which makes it easier for your body to absorb and use the nutrients). It has been clinically tested and found to be anti-aging and beneficial for cardiovascular health – (detox Antioxidant Supreme £15.00); Epsom Salts baths to assist in detoxification; lots of pure water to help flush out toxins. Dry skin brushing helps to boost your circulation and stimulates the lymph system aiding the detoxification process. While there is no universal anti-fungal diet that will work for everyone, certain foods are best avoided by those prone to yeast infections. In general, all sugars, baked goods, breads, refined flour, alcohol, vinegars, pickled vegetables, dried fruits, cheeses, and mushrooms ought to be avoided. All yeasts feed on and derive their energy from sugar, fermenting it to produce ethanol (alcohol) as well as a more serious toxic chemical, acetaldehyde – made during the digestion process. By reducing the amount of sugar in your diet as well as starches, carbohydrates, and alcohol – which all break down into sugar in the body – you'll be limiting the amount of sugar available to intestinal yeast. Also avoid honey, maple syrup, agave syrup and molasses. Ridding yourself of a sweet tooth will only happen if you eradicate extreme sweetness from your diet. After a couple of weeks you will become aware of just how sweet such foods as capsicum, carrot and tomato can be. There is also lots of new research which indicates that aritifical sweeteners are actually worse for you than plain old sugar. One study found that people given moderate doses of sweeteners had big negative changes in their gut bacteria very quickly and some went into a prediabetic state within just four days. Most processed and packaged foods (bottled, boxed, canned) contain sugar and ought to be eliminated from your diet. Dried fruits – apricots, dates, figs, prunes, raisins, etc. Food sensitivities can cause Candida and Candida can cause food sensitivities so it makes sense to have a test. There are several methods available. The preferred method at detox is Vega Analysis (it was the method that established my own food sensitivities). Food sensitivity testing is available by appointment. I test for 114 food, 35 vitamins and minerals and all the E-numbers. Foods tested are listed on the web site. Please check the list and if there are foods you consume regularly then these can also be tested. Up to five additional foods can be tested without charge. If you wish to bring more samples then an additional charge will be made. Results of the food sensitivity test are immediate and you will be provided with information on conducting an elimination diet. Please phone 0113 3910415 if you would like more information. Food Suggestions – What Else Can I Eat? Asparagus, courgettes, all salad greens, tomato, capsicum, aubergine, sweet potato*, carrots*, peas*, brussel sprouts, sprouted seeds and beans, french beans, runner beans, jerusalem artichokes, broccolli, cauliflower, onion*, leeks, swiss chard, cabbage, kale, spinach, spring greens, pak choi, radish, cucumber, avocado, turnip/swede*, sugar snap peas, celery, cress, water cress, pumpkin*, olives (especially good as candida dies on contact with olive oil) etc. Those marked with an * consume only one per meal and no more than twice per week. Brazils, hazelnuts, almonds, walnuts, cashews, sunflower, pumpkin, pine nut kernels, sesame, black seed, pecan, chia, coconut, flax, poppy. Fats: cold-pressed oils such extra virgin coconut oil, flaxseed, olive, sesame, and sunflower butter, rice bran oil, beef dripping (really). Avoid all light oils and the polyunsaturated oils such as sunflower that have been heat treated (generally the bulk of oils in the supermarket). Berries: strawberry, blackberry, raspberry, blueberry, cherry, apple, pear, lemon, peach, plum, kiwi, clementine. While you may not enjoy the effects of limiting certain foods forever, the plan is that by eliminating yeast's favourite products from your diet for a month or so (might take a lot longer for some people), your symptoms will decrease. A course of colonics will help expedite the removal of toxic waste from your body. This is especially important whilst treating a yeast overgrowth, as cell die-off can contribute additional waste for your system to cope with. Colonics can quickly remove stale and stagnant waste which may be harbouring hidden colonies of yeast. In addition gas and mucous will be removed as well as undigested food stuffs. You are likely to feel significantly revived after a colonic; light, fresh and clean, and will be well hydrated with a flatter tummy and no bloating. Colon hydrotherapy is available at detox by appointment. If you do not wish to have colonics then similar results can be achieved by using herbal or oxygen colon cleanser supplements (please contact detox to discuss your requirements – choice of products will depend on bowel function). If you are constipated it is especially important to clean your colon as slow moving, putrefying waste simply encourages more yeast. You can also use enemas although they will not achieve the same result as a colonic but will still be useful. Some Candida sufferers experience a die-off or Herxheimer reaction as a result of antifungal treatment, resulting in symptoms that can include headaches, fatigue, flu-like symptoms, and/or worsening of the symptoms already being experienced. This die-off reaction may be caused by the rapid destruction of yeast, which can overwhelm the body with Candida cells and their toxins. If waste is not eliminated rapidly during your yeast overgrowth detoxification regimen, your colon will simply re-absorb all the toxins accumulating from dead or dying yeast cells. A colonic at this point can be particularly helpful and can make a considerable improvement to how you feel. By cleansing your colon, fewer toxins will get re-absorbed into your bloodstream from the colon, easing the workload for your other major cleansing organs during this time of added bodily stress. It is a good idea to take additional fibre to aid the colon cleansing process. I stock an excellent product which contains digestive enzymes, psyllium husk, L-Glutamine (which aids recovery of the gut) and both pro and prebiotics (Go Daily). If you feel very unwell at the beginning of the cleansing process then you may feel better if you slow down the die off process. Some people will experience a big reaction just by cutting out sugar. If you have an extreme reaction then cut back on supplements, particularly high dose probiotics, and concentrate in the short-term on getting the sugar out of your diet. Your symptoms are likely to settle fairly quickly. Please feel free to call me (Jane) on 0113 3910415 if you want to discuss your reaction, for further advice or even just for some reassurance. The opposite of the term antibiotics, probiotics, are antagonistic to Candida and other yeasts. Yeasts in the colon deplete nutrients, and ferment foods, which often leads to gas, bloating, abdominal discomfort, and flatulence. It is also important however to provide your digestive tract with other strains of bacteria. For example Bifidum bacterium, an alkaline forming bacteria, lives in your colon which is a mildly alkaline environment (when it is healthy). 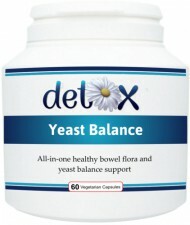 For this reason, detox Yeast Balance contains Lactobacillus acidophilus and Bifidum Bacterium and Probiotic Max, Beneficial Bacteria and Go Daily all contain eight different strains of bacteria providing full spectrum support for your digestive trtact. You should also support your gut to produce it’s own bacteria by consuming sauerkraut (make it yourself though because shop bought sauerkraut is unlikely to be live), garlic, onions, artichoke, goji berries and lots of leafy greens which all help your gut to produce and support it’s own bacteria. Go Daily also contains vegetable prebiotics to perform this function. Olives are also helpful in the fight against Candida which has been observed, in scientific studies, to die on contact with olive oil in a petrie dish. Olives are however notoriously bad for additives. Many commercially produced olives contain glucous ferronates (check the label) which have been linked with Alzheimers in agricultural workers. The only olives in the UK I recommend are those produced by Olives et Al. Not only are they really delicious (even people who claim not to like olives are often converted once they taste them) they have absolutely no junk, no additives, preservatives etc. You can buy them online at http://www.olivesetal.co.uk. Since food sensitivities are often experienced by people struggling with chronic Candida, part of any treatment regimen ought to include probiotics. Additionally, whenever antibiotic medication is necessary, it makes sense to use a high dose probiotic once the course of antibiotics is completed. Because yeast overgrowth depletes the nutrients in your body, it is necessary to incorporate a strong digestive support multi-vitamin into your yeast overgrowth regimen. Food Sensitivity Testing at detox also includes testing for 35 vitamins and minerals so you can identify particular nutrients you are short on. You can be tested for vitamin and mineral deficiencies alone for £35 although if you have deficiencies it would then make sense to have a full test. Without complete digestion, we cannot benefit from the healing properties of the food we eat. Unfortunately, the natural secretions of hydrochloric acid in our stomachs – necessary for breaking down food so it can be easily absorbed by the small intestine – tend to decrease as we age. Hydrochloric acid is a powerful defence against bacteria and parasites as it activates pepsin, and works to kill the harmful fungi and bacteria found in food. Low hydrochloric acid or low stomach acid as it is often called, can lead to malabsorption, intestinal distress, and allergic reactions to various foods, all of which severely weaken the immune system. Supplemental hydrochloric tablets with meals can help our bodies to more effectively break down food, fostering better use of the proteins, vitamins, and minerals in our food. Detox digestive enzymes complex, Well Digested, also contains HCI. The tough outer cell walls of Candida are comprised of protein and cellulose, which can present a difficult barrier for anti-fungals to penetrate. By using both an antifungal (Yeast Balance) and digestive enzymes (Well Digested) to break down yeast cells walls – Candida Albican's cell walls are destroyed, enabling the antifungal to act more quickly to destroy the organism. During your recovery you need to rest and be kind to yourself. Do not indulge in strenuous exercise which will only put more strain on your body. Yoga, Tai Chi and other calming forms of exercise will be far more beneficial and will help your body to heal and boost your immune system. Meditation can also be useful. Yeast overgrowth is a complex and far reaching health problem, one with no easy answers or snap solutions. To resolve your specific struggle with Candida will require a commitment of both time and patience on the part of you and your health care provider. It is necessary, therefore, to work with someone you trust and with whom you feel comfortable. It is important to do everything you can, while not being too hard on yourself, or expecting miracles overnight. Eventually your body will respond, and let you know that your treatment regimen is working. And though for some it can take years before a serious reduction in symptoms occurs (this is however quite unusual and only in the most extreme cases or where there are other health issues), most people report significant improvement after as little as two weeks of treating the fungus, in addition to making various other changes. The best part of the yeast overgrowth treatment process is that when symptoms do finally diminish, many people report – in addition to the disappearance of their symptoms – that their overall health has improved dramatically, beyond what they ever imagined to be possible. The following Products are valuable and can all be used together. If you suspect you may have had Candida overgrowth for a long time or if you have been feeling very unwell then introduce the supplements slowly and one at a time. You may have less of a cleansing reaction if you first eliminate the sugar from your diet and let your system settle before taking supplements ( a week or so should be enough). Then introduce one supplement at a time allowing several days before adding anything else. If you have reason to believe you have a light to moderate overgrowth or if the overgrowth does not have a long history (i.e. you can pinpoint a not too distant time when it started or have not been having any extreme symptoms) then you can go straight onto the full regime. Well Digested is a comprehensive digestive enzyme formula to maximise digestive efficiency.In addition to improving digestion it also helps to crack the outer shell of the yeast making it easier to be digested and eliminated. A combination of ingredients widely believed to be effective against candida overgrowth.Yeast Balance A comprehensive formulation that provides the convenience of just one supplement. High strength eight strain probiotic supplement with 20 billion bacteria per capsule. You can take it for two weeks then switch to Good Bacteria. Periodically switch back to Probiotic Max to boost results. High quality, eight strain probiotic for full spectrum support – perfect for use after Probiotic Max and for long term daily use. Highest level of antioxidants available in the UK. Nutrients from food source, highly bio-available, 22 fruits and vegetables. Clinically tested and proven to be anti-aging. Aid the detox process and support your liver. An advanced combination of ingredients to support the liver and gall bladder. Happy to Help You Help Yourself! If you would like assistance deciding which would be the most helpful products for you then please feel free to call me, Jane, on 0113 3910415 or e-mail: info@detoxonline.co.uk I have personally used all these products and have been using them in my clinic for 10 years.